Alan Harris is probably best known for his meticulously accurate field-guide illustrations. He is a dedicated field ornithologist and has travelled extensively in search of birds, particularly in the Middle East and the Mediterranean, but also Canada, Florida, the West Indies and Hong Kong. Alan was born in Essex in 1957, and was keenly interested in the natural world from an early age. At the age of fourteen, he joined the Rye Meads Ringing Group. His teenage years were spent training to ring, and the opportunity to study live birds 'in the hand' was crucial to his approach to bird illustration. The time spent examining birds' structure, age and moult has been pivotal to his development as a bird artist. After leaving school, he studied Graphic Design at the Middlesex Polytechnic and in 1980 embarked on a freelance career. Over the years, he has illustrated over 80 books or magazines, including The Macmillan Guide to Bird Identification and the accompanying Macmillan Birder's Guide to European and Middle Eastern Birds; Storks, Ibises and Spoonbills of the World; Kingfishers, Bee-eaters and Rollers; Finches and Sparrows: an Identification Guide and Sylvia Warblers and made major contributions to avifaunas of various regions of the world, notably in the Indian subcontinent, Central Asia and East Asia in the Helm series. Alan won the British Birds magazine 'Bird Illustrator of the Year' award in 1982 and has been joint Art Consultant to that magazine since 1988. 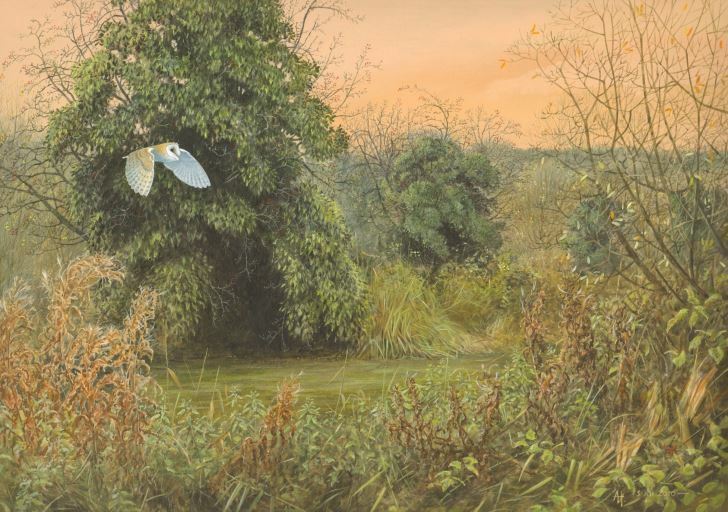 Alan spends most of his birding time in the Lee valley, on the border between Essex and Hertfordshire, England and this area provides inspiration for many of his paintings. He is still very much an active ringer, operating with the Rye Meads Ringing Group and North Thames Gull Group. Alan now spends more time painting, often using material from earlier years of sketchbook archive. Often the inspiration will not be the bird, but a landscape, where Alan will see the potential and place a bird into that landscape. Almost as a reaction to painting large clear portraits of birds with minimal background for book plates, Alan’s paintings are often of scenes with the focal point bird very small in the painting. Whilst most of Alan’s book plates are executed in a mixture of watercolour and gouache, his paintings are often in acrylic.